Beans seem like the ultimate beginner crop. They’re easy to grow and save seed from, they’re nitrogen fixing and unfussy about soil conditions, and there’s tons of varieties for gardeners to choose from. They’re also a great source of protein for those looking to produce more of their own diet. 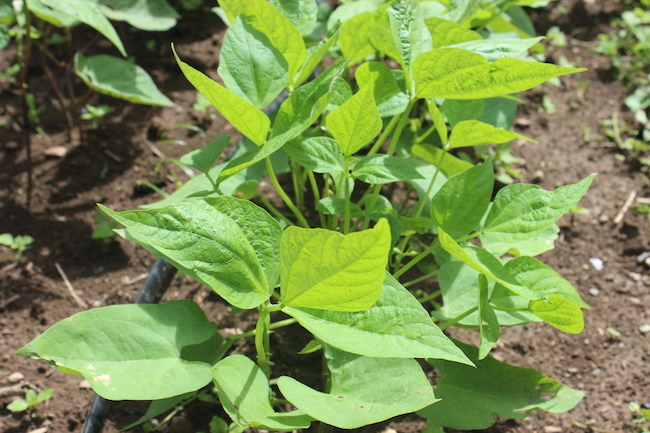 Beans are perfect until you come out to your garden to find all parts of the plant have been thoroughly chewed on. 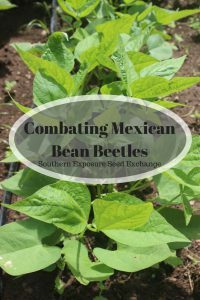 Mexican bean beetles can become a huge problem for gardeners hoping for a great bean crop. You may first notice them by the damage done to the leaves of your plants. Bean beetles eat the leaves from the underside and leave them with a lace-like appearance. If left to continue they will eventually kill the plant. They also eat the beans and you may notice chunks missing from them or a brown, scabby spots. The beetles themselves are easy to identify. They lay small yellow eggs in clusters glued to the underside of the leaves. The larvae are bright yellow and spiny and will stand out on your bean plants. As adults they look like a light orange colored ladybug and are in fact as species of ladybug. 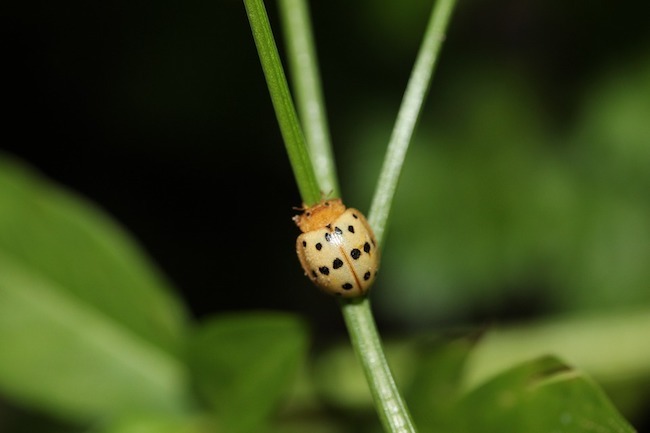 Note that other species of ladybug are beneficial and eat harmful insects and aphids. There are several ways to combat bean beetles and what works well for one person may not work well for everyone. Every garden is unique. Neem oil can be purchased as an OMRI (Organic Materials Institute) certified pesticide or fungicide derived from neem seeds. It’s effective at combating Mexican Bean Beetles however it may harm beneficial insects in your bean patch as well. Not the most fun option, but some people find hand picking to be effective. You can just smash the eggs and pick off the larvae and beetles and place them in a bucket of water and a little dish soap to kill them. However if the beetles are particularly abundant in your garden or you have a large bean patch it may be difficult to keep up with them. Most of the time it’s good to keep your chickens out of the garden. You don’t want them eating your harvest or digging up seedlings in their quest for grubs. However if you have bean beetles you may want to let your chickens into your bean patch for a snack. Although it may seem like a drastic and expensive option row cover is very effective if used from the start of the season. It can be used multiple years. Milky Spore is a bacteria that kills Japanese beetles however some gardeners say that they’ve successfully used it to kill Mexican Bean Beetle larvae. Milky Spore Powder is OMRI certified and safe to use on organic gardens. Mexican bean beetles don’t hatch out in the early spring or fall so you may be able to get a crop in before or after they’re really an issue. Some varieties will attract more bean beetles than others. If you find one that’s a favorite you may be able to use it as a trap crop to draw the beetles away from your other varieties. You can burn your trap crop plants and the beetles on them. There are many creatures that feed on Mexican bean beetles including toads, some birds, several species of parasitic wasp, tachinid flies, and spined soldier bugs. By creating habitat for them in your garden you may be able to reduce your bean beetle problem. Some insects like parasitic wasps and spined soldier bugs can also be purchased and released into your garden. Don’t let bean beetles stop you from planting beans. There’s plenty of ways to combat bean beetles so you can still have an excellent harvest.